New Zealand 5-204 ( Colin Munro 73*, Anton Devcich 59, Al-Amin Hossain 2-31) beat Bangladesh 9-189 (Mushfiqur Rahim 50, Mahmudullah 34, Tim Southee 3-38, Corey Anderson 2-21) by 15 runs. The visiting New Zealand ended up their horrible tour of Bangladesh while beating the hosts in the only Twenty20 with ease at Mirpur. The Balck Caps thrashed 5-204 in the allotted 20 overs and the Bengal Tigers managed 189 with one wicket remaining. Colin Muro (New Zealand) was declared ‘Player of the match’ for his spicy unbeaten knock of 73 from 39 mere balls. The game was played on Wednesday, November 6, 2013, at Shere Bangla National Stadium, Mirpur. Earlier, Kyle Mills won the toss and went into bat first with Anton Devcich and Hamish Rutherford. They got off smartly as the first opted to attack from the word go. Devcich smashed his maiden T20 fifty on just 24 balls while his partner departed at 73 for 17 and he became the second victim, ten runs later for 59 off 31 balls with 1 six and 10 fours. Colin Munro and Ross Taylor took over the charge and the first attained his first T20 half century on the 27th delivery. The association was broken at 176 when Taylor was dismissed for 28 while Colin Munro stood firm at the crease for 73 off 39 with 5 towering sixes and 3 fours as the Kiwis powered 5-204. Al-Amin Hossain was the highest wicket taker with two whereas Sohag Gazi, Abdur Razzak and Ziaur Rahman claimed one each. Bangladesh had a horrible beginning by losing their three top order batsmen at just 19 runs. 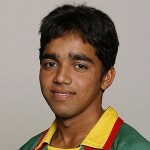 Mushfiqur Rahim, the captain of the home side, consolidated the innings with a couple of partnerships. He reached his first T20 fifty in the process and became the fifth victim at 116 after scoring 50 off 29 with 1 six and 7 fours. Mahmudullah and Sohag Gazi kept the hope alive for the hosts and enhanced the score to 177 when the latter was run out for 24. Mahmudullah followed him at the same total for 34 as the Bengal Tigers scored 189 for the loss of nine wickets in 20 overs. Tim Souhee was the supreme bowler with three wickets, Corey Anderson got two whereas Mitchell McClenahgan, Kyle Mills and Nathan McCullum shared one wicket each. New Zealand grabbed the encounter by a margin of 15 runs that was their first win against Bangladesh on their recent visit.